This spiced apple & pear jam is a great way use up a glut of autumn fruit. It's delicious spread on hot buttered toast or with scones and clotted cream. As far as jam making goes, the recipe is foolproof and very easy to scale up. (If you have never made jam before you may find this blackberry jam post useful. It contains lots of jam making tips and a step-by-step jam making recipe video as well). I was given lots of apples & pears in the autumn which I peeled & chopped, sprinkled with lemon juice and froze in bags. I used all the frozen fruit to make the apple & pear jam straight from the freezer. I made it into some homemade Christmas gifts for boys teachers using some cute little Ikea jars checked fabric. The spices make this jam smell really Christmassy and the addition of brown sugar gives it a lovely deep colour. Pop a couple of saucers or small plates in the freezer for testing the jam later on. Sterilise some jars for storing your jam. Wash them thoroughly in very hot soapy water. Rinse well, pop them on a baking sheet and put them into the oven at 140 C / 120 fan / gas mark 1 until completely dry. Turn off the oven leaving the jars inside until ready to use. Place the apples and pears in a large pan and pour over enough water to just cover them. Gently simmer the fruit for around 20-30 minutes until very soft. Add the sugar, lemon & clementine juice & zest and spices to the pan. Over a low hear, stir well until the sugar has dissolved completely - this will take a few minutes. It's really important that the sugar has completely dissolved before moving onto the next step. If you prefer smoother jam, you can use a potato masher to mash up the fruit as much as you like. 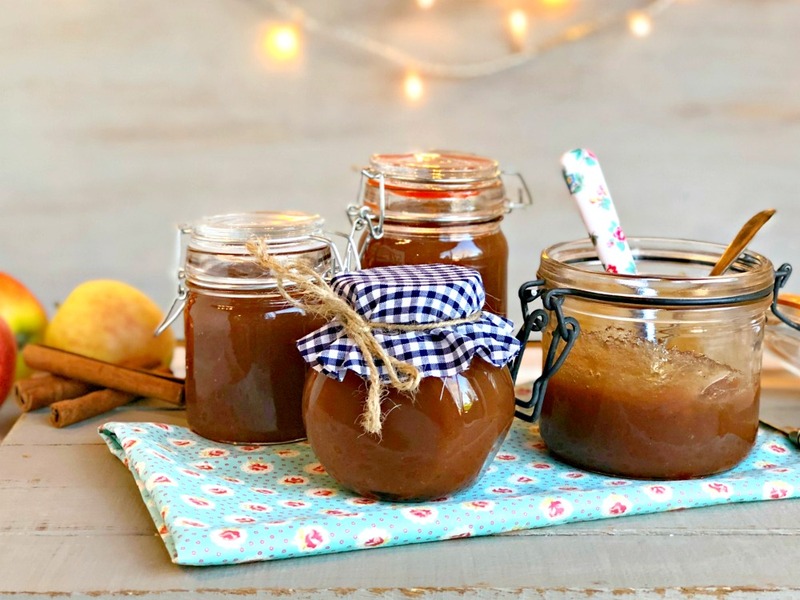 I prefer this type of jam made with apples and pears to be smooth, so I mash it lots, but if you prefer some texture then leave the fruit chunky. Increase the heat and bring the jam to a rolling boil for 5 minutes (if you have a jam thermometer rolling boil is 104 C). Be careful as hot jam can seriously burn! Take one of the saucers from the freezer and spoon a little jam onto it. When it cools, push the jam with your fingertip. If it wrinkles then it's ready. If not, boil for a further 3 minutes and do the saucer test again. Take the jam off the heat and stir in the butter (which will disperse any 'scum' which may be on the surface of the jam). Leave to cool for 15 minutes. Pour the jam into the hot jars and seal immediately. Will keep for a year unopened. Refrigerate once opened.